The AR is a new Noveske and the Sig is an early model 556 ER with mostly Swiss internals, it has never jamed and is highly accurate. What do you guys think! Pretty, if you like that sort of thing I guess. Gonna make a great artificial reef one day. Looks like a lot of extra money and weight for no return on investment to me....... but if you are happy with it that is all that matters. Sweet. Now you need optics! Needs more ugly toes in the pic and maybe some chips on the floor or something if you want to fit in. 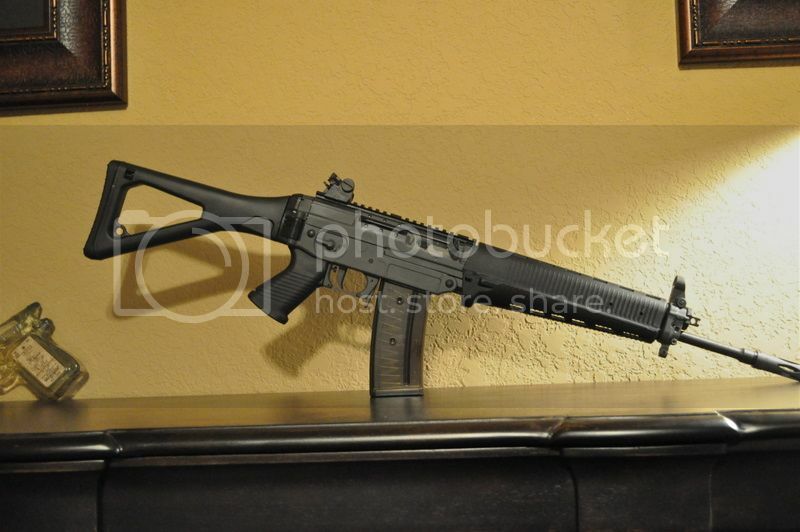 I love my early serial # Sig 556. Never a problem with any ammo I have fed it. I love the FAL style recoil. Amazing trigger. It is my go to rifle. Although my 10" 300 blackout AR is edging its way in. He is correct. The Sig 556 is heavier than an AR. It also cost me more than an AR with similar features. But I like it enough that it works for me and I'd buy it again.